I know it's been raining for the past days but that doesn't stop me from eating my favorite dessert. Buko ni Fruitas! 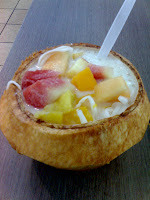 It's like the traditional halo-halo its just that the sahog are fresh fruits. 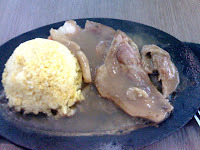 But before that, I ordered a sizzling pork chop at Sizzlers for my lunch. Grabe, ang sarap naman! Now, i'm starving, gustong kainin yang nasa pic, hehe! Top 5 Things To Do. Do you need such mouse pads?